This is 3rd-party, modern, preference pane replacement for the Unitor 8 Control application. It allows you to configure the settings of the Emagic Unitor 8 USB midi interface. 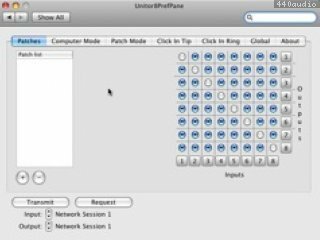 UPDATE 1: Unitor 8 Preference Pane is now 64-bit and available for 10.6 Snow Leopard and 10.5 Leopard. Development might move slow, but it does move! UPDATE 2: version 0.9.6 - Fixed a silly bug that showed up when I tested it on Snow Leopard where the device selector would dissapear. Patch editing with copy, paste and initialize.